The classroom computer is no longer confined to a box on the desk. Mobile handheld computing devices have evolved into powerful and affordable learning tools. Handheld technologies are changing the way people access and work with information. The use of Personal Digital Assistants (PDAs or handhelds) has been an evolving part of the business world for more than 15 years and the implementation of these devices in higher education has often followed that business model. This article will provide research findings from a case study concerning the use of PDAs to support the integration of technology into a Teacher Education program at a midwestern university's College of Education. Franklin, T., Sexton, C., Lu, Y. & Ma, H. (2007). PDAs in Teacher Education: A Case Study Examining Mobile Technology Integration. 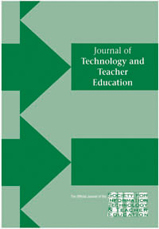 Journal of Technology and Teacher Education, 15 (1), 39-57. Waynesville, NC USA: Society for Information Technology & Teacher Education. Retrieved April 18, 2019 from https://www.learntechlib.org/primary/p/6207/. Campus Technology from the Syllabus Media Group. (2004 , December). Samis , M . (1994 , October) . The digital apprentice . E lec tron ic Learn ing, 14 , 42-46 .